A static value is used with this option. Opens a dialog where a static value can be created. A system value is used with this option. Opens a dialog where a system value can be created. Generates a GUID that is used as a user-defined value. 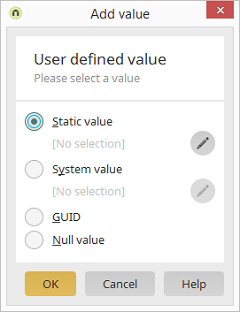 The value NULL is used as a user-defined value.